Well, a week after the storm, on St Patrick’s Day, we went snowshoeing for a few hours from the Mt Rose Campground to Tahoe Meadows and back, a bit less than three miles all told. 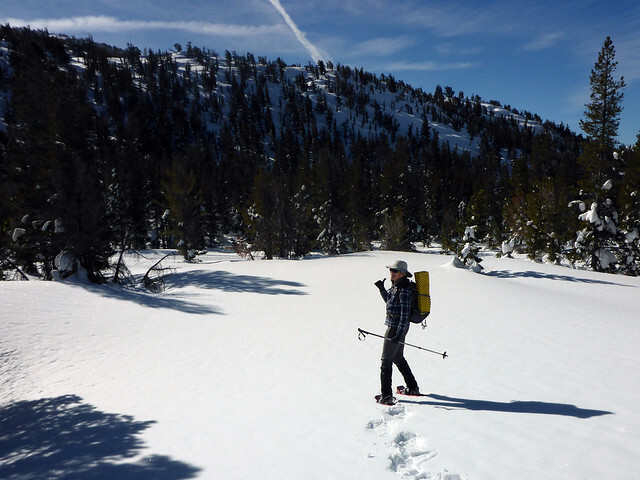 The original idea was a winter summit attempt on Mt Rose herself, but we got discouraged at the beginning by no clear boot track from the parking lot and anyway we still weren’t that familiar with the snowshoes. So instead we walked across the highway and went for a stroll through the Mt Rose Campground and then down to Tahoe Meadows, where we enjoyed a mid-morning snack. It’s been warm the last few days, so the snow was a bit crusty on top, which made the snowshoeing a little less pleasant and a lot louder! But despite the crusty surface, it was still soft and deep just below and the snowshoes were necessary pretty much as soon as we got off the clear pavement. 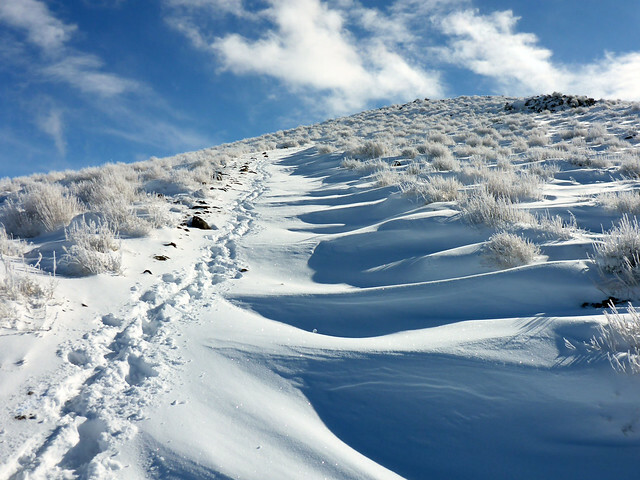 I definitely intend to get up Mt Rose this winter, or at least before the snow is gone. It might be easier to navigate up the Relay Ridge Road. Another idea we have is to make it an overnight, since we move much more slowly over deep snow, and that’s the only kind of snow we have up here. Bella was injured a year ago walking in deep snow, and so we left her behind for this hike. She would not have enjoyed it after the first few minutes. We felt very bad leaving her behind, and that was one reason we cut the hike short and headed back before noon. One of the highlights of the day occurred as we were driving home down Mt Rose Highway. Between Edmonton Drive and Bargary Way we saw no fewer than 20 mule deer bounding along in people’s backyards a few feet from the highway. It was remarkable, I’d never seen so many deer at once. We pulled off the highway to watch them for a few minutes after they stopped running and simply milled around in the sage. Sorry I didn’t get a photo. Maybe next time. Today dawned cloudless, with snow thickly covering the surrounding mountains and hills. It was a full moon last night, and as I commuted into work (driving mostly into the west) I watched it slide behind the Sierra Nevada. It was quite a sight. By chance, the moon, which was huge this morning, slipped behind the ridge just as the latter caught the first rays of the sun streaming over the Virginia Range. I was a glorious sight and would have made a spectacular photograph from the top of my street. Sunrise today was at 6:47am, while the moonset was at 7:03am. Obviously, the moon sets behind a different part of the mountains throughout the year, and the snow and cloudless sky certainly helped in the effect. And the full moon. Tomorrow the sunrise and moonset should correspond similarly to this morning, but it’s supposed to be stormy. We probably won’t even see the moon. Back in 2015 I started working on a project for producing a kit for home builders to make their own AR-15 lower receivers. I called the idea Silver, and it was really going to be a sort of hobby thing for me, separate from my day job. Life got in the way and I never did anything with it, until this week when I sent out to have glass filled nylon SLAs (3D printed models) of the parts made. I’ll have more on that project in a few days after I receive and assemble the parts. Since I started working on Silver, home-made firearms have been very much in the news, not because they are causing a lot of problems, but because a lot of politicians want something to talk about besides the difficult problems they were elected to solve, because solving difficult problems is hard. So they have a new word for home-made firearms: they call them “Ghost Guns.” Get it? No, I don’t either. But politicians like to put out a lot of press releases and hold press conferences about “Ghost Guns,” and the press, generally not being very thoughtful or intelligent, well, they just east this stuff up. Ghost Guns! Americans, probably uniquely, are legally permitted to manufacture firearms at home, and there are a hell of a lot of Americans doing it. They mostly do it for fun, as a hobby, in the same way that home woodworkers will build furniture that they could easily purchase at a fine furniture store. That’s kind of an American thing, actually, always has been. Next you have the kit builders. This is a much bigger hobby in the US, and is a direct result of the 1968 Gun Control Act and later clarifications by the ATF that prohibited the importation of “non-sporting” firearms into the US. Now, military designs of all types have always been of keen interest to American firearms enthusiasts, but the “non-sporting” clause basically cut off the supply of many foreign military surplus platforms. So instead a new industry emerged where importers would buy up lots of surplus rifles from various governments; “demil” them by literally chopping them up with a saw or acetylene torch; then import them into the US for sale to hobbyists as parts kits. After that it was up to the hobbyist to make a new receiver (usually out of steel) and put the parts back together. Then there is the so-called “80%” market. This came about because of the modularity of the AR-15 pattern rifle (which I will get into below), and the opportunity for non-FFL manufacturers to produce “80% complete” AR-15 lower receivers that the hobbyists could finish making at home with a drill press and/or a router. The 80% business has spread to many other platforms, including some handgun designs. Finally, there is the vast universe of the homemade AR-15 lower receiver itself. As I mentioned, the AR-15 pattern rifle is extremely modular, with all its components available from any of hundreds of manufacturers and suppliers, and all these parts can be fitted together more or less like LEGO to build rifles. All the parts except the receiver, including the bolt assemblies and barrels, can be purchased without paperwork by anyone, from anywhere, at least within the US (ITAR regulates and restricts the international commerce of gun parts). So anyone with a credit card can buy everything he needs to build an operational AR-15 rifle without leaving his couch, except the receiver, which has a serial number and which (when buying a new one) requires a background check and a Form 4473. 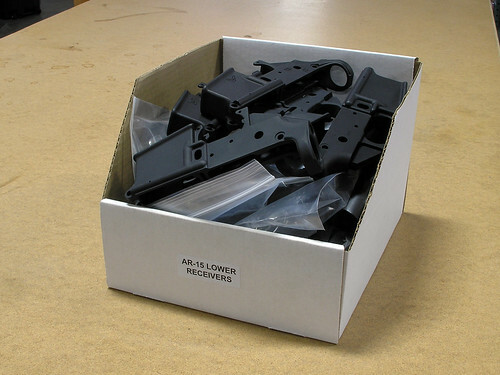 So lots of guys like to come up with new ways to make an AR-15 lower receiver, because once you have the receiver you can get the rest from Brownells or MidwayUSA. These have all been purchased over the years from gun stores, with the background checks and Form 4473s, etc. Over the last couple years my cache of lowers has been depleted by projects, including rifles I built for two of my employees. A local gun store had a sale where they were selling Anderson lowers for $39 each (regular price $60). I bought four $39 lower receivers, and brought my supply back up to 12 proper AR-15 lowers (plus two clear plastic lowers I might someday build into .22 rifles; a weird skeleton lower I’ll probably end up selling; and a pair of lowers that don’t accept magazines that I bought during the California AR-15 interregnum of 2000-2005 and which are now museum pieces). Finally, there is my own Silver design, using aluminum extrusions. As you can see from the photos and videos at the links above, most of these home-built AR-15s are really rather ugly. The steel and wooden ones especially are a lot of work to produce. People aren’t making these just because they need or want an AR-15 rifle; they are doing it for the fun and the challenge. Despite the rantings of grandstanding politicians, these “Ghost Guns” are rarely being produced for nefarious purposes. There have indeed been occasions when prohibited felons made their own firearms and used them in crimes. But generally if you are a prohibited person and aren’t worried about following the law anyway, you will probably procure a firearm either by stealing one; buying a stolen gun on the back market; or buying a legitimate gun in a face-to-face unpapered transaction in any of the 40-45 out of 50 American states where this is legal and common (the dreaded “First Amendment Loophole”). You aren’t going to go through all the hassle of making a “Ghost Gun” out of aluminum or plastic; that is strictly for hobbyists and enthusiasts. The Carthaginians tell us that they trade with a race of men who live in a part of Libya beyond the Pillars of Herakles. On reaching this country, they unload their goods, arrange them tidily along the beach, and then, returning to their boats, raise a smoke. Seeing the smoke, the natives come down to the beach, place on the ground a certain quantity of gold in exchange for the goods, and go off again to a distance. The Carthaginians then come ashore and take a look at the gold; and if they think it presents a fair price for their wares, they collect it and go away; if, on the other hand, it seems too little, they go back aboard and wait, and the natives come and add to the gold until they are satisfied. There is perfect honesty on both sides; the Carthaginians never touch the gold until it equals in value what they have offered for sale, and the natives never touch the goods until the gold has been taken away. Every time I start a new project, either personal or for work, I first give it a project name. I started doing this about seven or eight years ago and it has contributed immensely to my personal and professional organization. It’s like using paper files. I mentioned this practice to my IP attorney, and he heartily approved, I think for reasons of operational security, but mostly its a mechanism to help me keep track of . . . projects. It’s also very useful when working with others, such as other employees at work or engineering contractors, because there’s no ambiguity when referring to a project name as there might be when using a mere project description. Project names are assigned randomly. I use an Excel spreadsheet (natch) which includes a hidden column of unused project names. When I add text to the next cell in the description column, a new project name automatically appears. Since the unused project name column is hidden, the new project name is a surprise. Makes the whole thing a little more fun. The challenge, of course, is coming up with that list of project names to begin with. The set of names I work from has to be a large one, because I literally write down every idea I have and give it a project name, even if there is little chance I will ever do anything with it. My project list is a convenient way for me to record — and organize — my thoughts and ideas. When I was at Cisco, projects had themes: for example, development projects related to a particular router device might be snakes (“Rattler,” “Asp,” “Cobra,” etc), or perhaps national parks (“Yellowstone,” “Yosemite,” “Denali”). When I started using project names for my work, I took the Sierra Club Hundred Peaks list of mountains and rocks and randomized them (“Amethyst,” ” Chuckwalla,” “Galena,” “Bear,” “Butler,” etc). But eventually I started running out of names, so I cast about for other lists, other sets. So I used names of all the counties in California; all the counties in Nevada; names of seas; counties in Ireland; names of constellations (which get a little hairy). Finally, I found a list of all the Nobel Prize for Literature laureates and added those. I have plenty of names for now. But you can never have too many potential project names. I have a list of 164 UN member names (“Panama,” “Kazakhstan,” “Iran,” “Namibia,” “Peru”); 44 American states (“Wisconsin,” “Indiana,” “Alabama,” “Pennsylvania,” “Texas”); 567 auto marques of nine characters or less (“Transinco,” “Frontenac,” “Moskvitch,” “Lambretta,” “Voglietta”); 81 US National Parks (“Gates,” “Hagerman,” “Jewel,” “Hanford,” “Vermilion”); 511 Christian saints (all denominations) (“Anthony,” “Venantius,” “Ursmar,” “Wulfram,” “Severinus”); and 112 Old Testament angels and prophets (“Jeremiah,” “Daniel ,” “Kushiel ,” “Ariel,” “Puriel”). If the numbers don’t seem to match (44 American states?) it’s because I edit each list to eliminate two-word names, etc. The trickiest part is eliminating duplicates from new name sets. I can do this using the Excel VLOOKUP() function. The lists themselves are randomized, by putting the RAND() function in a column adjacent to the names and sorting on that column (you will get a different sort order every time). Saturday night we got about as much snow as I’ve seen fall overnight since I moved here. That night I told Ingrid I wanted to do a snow hike the next morning, no matter the weather (it was expected to continue snowing into the morning). There was a misunderstanding. 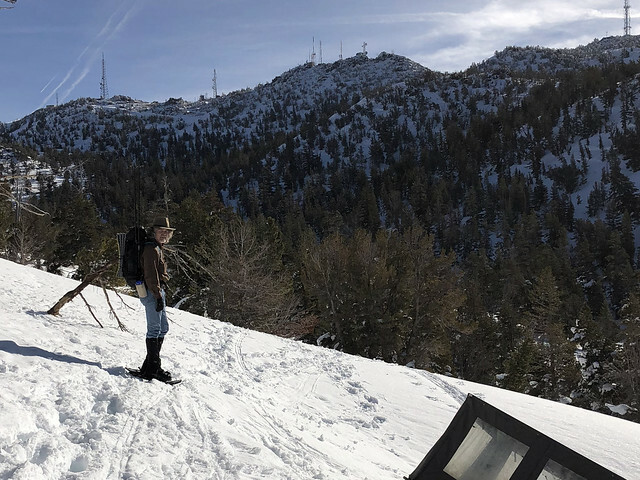 She thought I meant drive up to the Mt Rose Summit at 8,900 feet on Mt Rose Highway to hike the Tahoe Rim Trail, and so she started packing snowshoes, etc. But that wasn’t what I meant. The Mt Rose Highway was almost certainly closed Sunday morning, and it would have taken over an hour to get to the parking lot. No, I intended simply to walk to the top of our street and hike into the Virginia Range behind our house. No need to get into the car at all. The plan was to hike 2½ miles to the top of the ridge (1,500 feet elevation gain). Normally I do this as part of loop hike of five or seven miles, but there’s a very treacherous bit to that hike that I didn’t want to attempt in the winter, so I decided on an up-and-back hike instead. 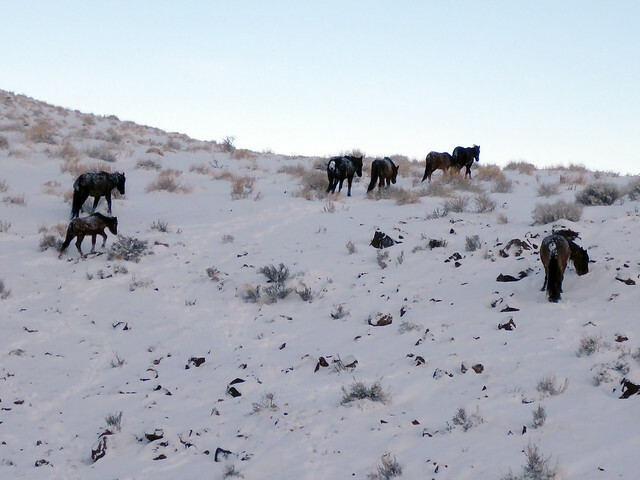 I noticed they all had snow on their backs, although it had stopped snowing at least an hour or two before. That means their shaggy fur coats actually provide pretty good insulation, so that made me feel a little better. 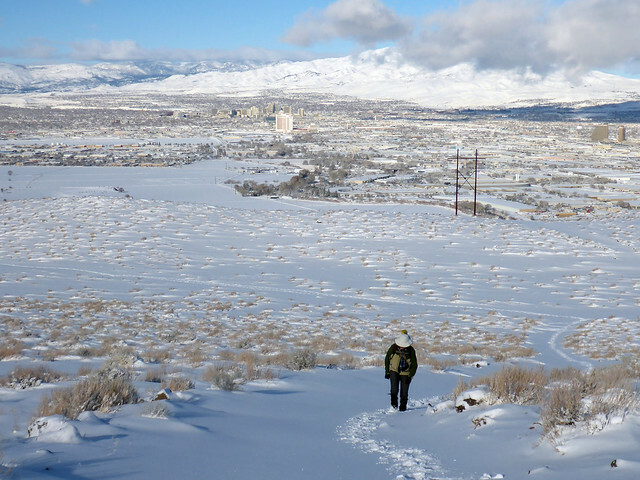 Eventually the sun came out, though it stayed cold, and we enjoyed a fantastic hike through virgin snow with amazing views of the city as well as Storey County to the east. It is such a blessing to have all this just a short walk from our house. It was about 14 degrees (F) when I left the house this morning at 6:15, which I think is as cold as it ever gets in Reno. That’s pretty cold if you are from SoCal or Florida, but compared to much of the rest of the country it’s not very cold at all. Last weekend’s snow is gone from most of the city, but our front lawn is on the north side of the house, so the snow lingers there, with a nightly accretion of coyote and quail tracks. It’s really wonderful. BTW, one of the first things I learned about dealing with the cold: we have a big chain link gate at the entrance to our office parking lot that we share with two other businesses, and since I’m always the first one to arrive in the morning it’s my job to unlock the padlock that secures the gate. The first really cold morning we experienced after moving here I couldn’t open the lock, no matter what. It was frozen. So I had to park the car outside and walk around the building to get in. Later in the day (after we finally got the gate open) I asked one of the other building tenants about this and she said it’s a common problem, all you have to do is hold the lock in your bare hand for about 45 seconds and it warms enough that it can be unlocked. And sure enough, it works just as she said, and that’s what I’ve been doing about a third of the mornings for the last three winters.